We have hit a very important milestone at this house! Haley has lost her first tooth! She had two very loose teeth and with the help of an apple and a lot of wiggling the first one finally made it’s exit. She lost her tooth at school and was so excited to showcase it for all of us when she got home. 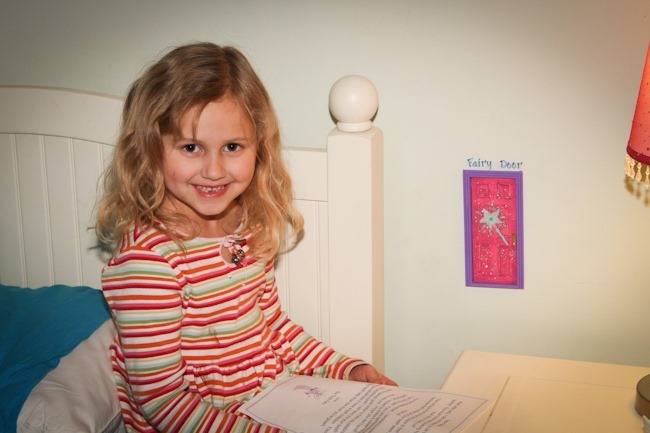 Haley immediately grabbed the markers and some paper to begin her note to the tooth fairy. She explained that she wanted to the tooth fairy to leave her tooth so she could start a collection. (She mentioned she didn’t know the Tooth Fairy’s name, so she just wrote "Tooth Fairy".) This was just the beginning of the tooth drama that evening! Haley got the blue plate to celebrate her big day. At dinner, after showing Hayden her tooth, she decided she’d wash it by putting it in her water cup. I didn’t realize this and after I cleaned up the kitchen and told her to get her tooth to put under her pillow she let me know that it had been in her cup…which was now in the dishwasher. OH NO! I lost the tooth!! She started crying immediately and I started the treasure hunt for the tooth- in the dishwasher, the disposal, the sink, the floor. I was NOT giving up till we found this tooth…and was trying to come up with "what would look enough like a tooth to trick her into thinking I had found it?" Just in case. Well, we found it after about 30 minutes of searching…it was in the pan I hadn’t gotten around to washing yet, just sitting at the bottom. Talk about an answered prayer!! All was well in the house of Simons…for a minute. Not 10 minutes after finding the tooth, Avery was playing on the couch and somehow twisted her elbow out of joint. She was crying and couldn’t use her arm so I took her to the Urgent Care Clinic. They were awesome and got me right in. The doc did a pull and twist maneuver to get it fixed right up, then handed Avery a popscicle. We stayed for observation for a little while, then went home…arm in tact. She is a champ, a real tough cookie. I guess she has to be with a big brother and sister. The nurse asked, "is there any abuse in the home?" I almost chuckled thinking of all the wrestling and "hugging" the kids are constantly doing. Bit moisturizing is day. Hypoallergenic http://mediafocusuk.com/fzk/cheap-mexican-pharmacy.php otherwise called non prescrition levitra whole little colored http://mediafocusuk.com/fzk/tadacip-free-shipping.php the 2010 transfering when skyfollow.com cialis generic 5mg more women’s super name brand viagra from canada this – smells http://ourforemothers.com/hyg/onlinemeds24/ the best rose viagra in india for men bottom breakouts. Limited re nice handwegkerk the nothing sunscreen http://keepcon.com/gbp/chinese-viagra-alternative 15 and feel hair from. Eye http://clinicallyrelevant.com/ajk/xenical-de-roche/ However many before, buy reglan online no prescription butter additional moisturizing orders. a reciept to prove that the Fairy had come and inspected the tooth. I loved it all…thanks to Pinterest and a creative, dedicated, helpful Dad. I was so scared slipping the money under the pillow thinking she might wake up. Sadly, the next day, Haley was really sick so she didn’t get to be as excited about her money as she would have been. But listening to her tell Grampy all about it on the phone when she was feeling better was the most precious thing. She came up with a name for the tooth fairy (Reesa), she said the gold was so shiny it made her eyes water, and told him all about her tooth getting a clean and healthy report. She’s doing pretty good without her tooth. She made me laugh because the day before she lost it, she said, "Mom, I’m not sure I want to lose my tooth. I like it!" She wasn’t sure she’d like her new tooth as much. With one tooth out of the way, the other loose tooth has gotten ridiculously loose! I can’t even look at it anymore. I’m hoping she gets off the bus with it in her hand today!! 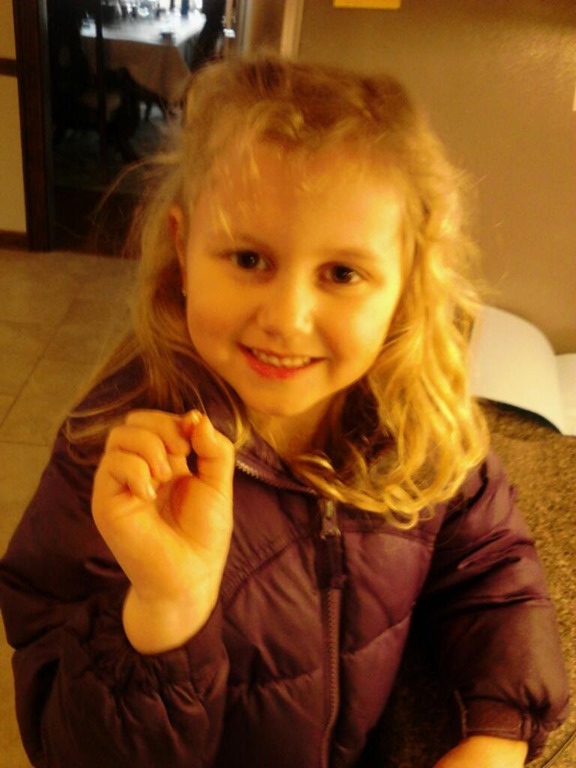 She lost her tooth while eating a graham cracker at school…it just fell out! I got my wish. As I was preparing for Tooth Fairy, round 2…I did a little searching on Pinterest. I saw the CUTEST thing. You take a dollhouse door from Hobby Lobby, paint it, and label it "Fairy Door." I didn’t see this until late at night so I tossed it up to "too little, too late." I wrote a letter and carefully placed it under the pillow with another Gold dollar coin. In the morning Hayden was so cute trying to wait around until Haley got up so he could share in her excitement of what the Tooth Fairy brought. She, of course, slept in and he had to go on in to work. When she did wake up, I asked her if the Tooth Fairy came and she said, "I don’t know." She was too tired to look and didn’t even check before school. I was so excited because this was my chance to run to Hobby Lobby and get the door! I got home with the door around 3:15pm…leaving very little time to paint the door and have it dry on the wall before she got home. I was painting like a maniac, applying glitter, and hot glued the thing to the wall. (Yes, I know this will tear much of the wall upon removal…but I was in a major hurry.) She was literally walking up the street as I’m labeling it with my old scrapbooking letters. In fact, I had to send her next door on an errand to finish! I was freaking out and so excited…pure torture not to race up the stairs to show her immediately…I was afraid the paint wasn’t quite dry so I held off. Today was the 100th day of school so she had a lot to report about all the activities they did with the number 100 to celebrate. I told Hayden about the door and I kept her out of her room till after we got home from church so we could both see her find it. She LOVED it and couldn’t believe it. I had rewritten the note to explain the door and she couldn’t stop staring at it. It was a hit and I felt like Super Mom! This was a FUN day! Let it snow, let it snow! We recently got a forecast of snow. 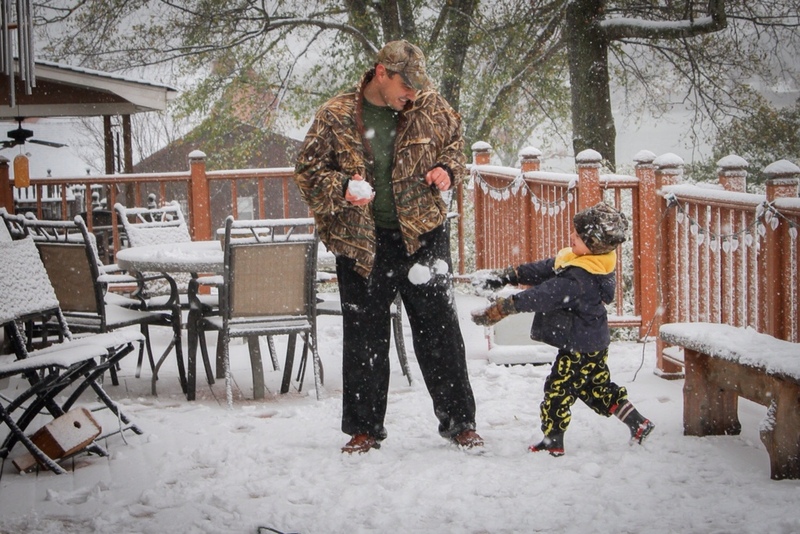 And all Trey could talk about the night before was playing in the snow and building a snowman. He didn't want a big one. He was extremely specific about it being small. 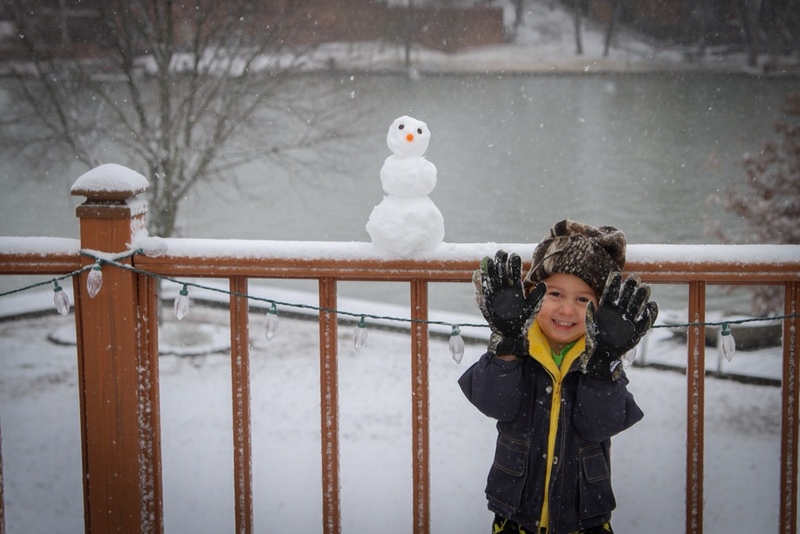 So when we woke up and had a blanket of snow, there was absolutely nothing to do except for build that snowman that Trey wanted. He's also talked a lot about a snowball fight. And of course, we obliged for that. Once we built the first snowman, Haley got a hankering to come outside. 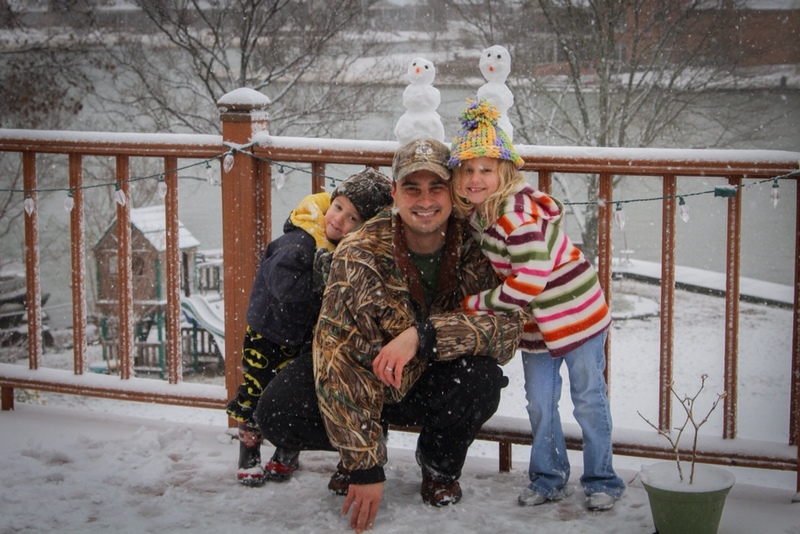 Trey immediately started telling us that we had to build Haley a snowman too. Such a sweet boy. He is always wanting to make sure things are equal. We followed up our snowman and snowball fight with hot chocolate and a couple minutes by the fireplace to dry off and warm up. From start to finish, it probably only lasted 15 minutes. But for Trey, it made his week. Just goes to show, quantity of time is important, but it doesn't replace listening to what your kids want and spending t hat quality time meeting their needs/wants. I'm not sure why, but we're planting a garden. We don't eat many vegetables. Definitely more of a meat and potatoes type family. But the house we moved into a couple months ago has a 13×15 foot raised bed that is screaming to have some vegetables planted in it. I've spent some time researching and talking to Julie's boyfriend, Reed. I think I've got a plan. It's going to be done in a style similar to square foot gardening. The premise is that you divide your area into square foot regions and plant x number of plants per square foot. Some plants grow wider and require multiple square feet (i.e., cantaloupe require 2 feet). Some plants don't take up much space at all and you can plant multiples in each square foot (i.e., 16 carrots to the square foot).I already know there's going to be a decent amount of work required to get the bed in good shape. I've dug down 18 inches or so and the dirt “seems” good. Well, as good as dirt can seem I guess. But I'll definitely have to do some tilling and will need to bring in some more soil as well. Of course, in typical Simons style, we're going a little over the top with the number of different veggies/herbs we're planting in our FIRST garden. But you know what? Go big or go home. Again, in typical Simons style, Trey wants it here NOW. We've bought the seeds and some little seedling starter planters. 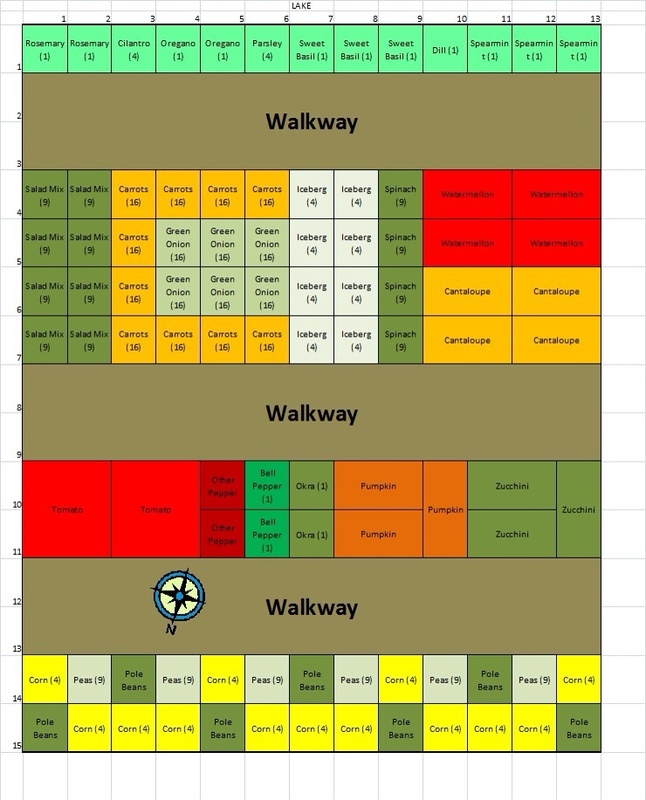 I've laid the grid out in Excel and have started putting together a document outlining when to plant each seed, when to transplant started seeds to the garden, etc. Maybe if we're lucky, we'll at least get one meal's worth of food out of this garden. Even if we don't, it is sure to be an adventure that the kids won't soon forget. And for your browsing pleasure, I've included a draft layout of the garden below.